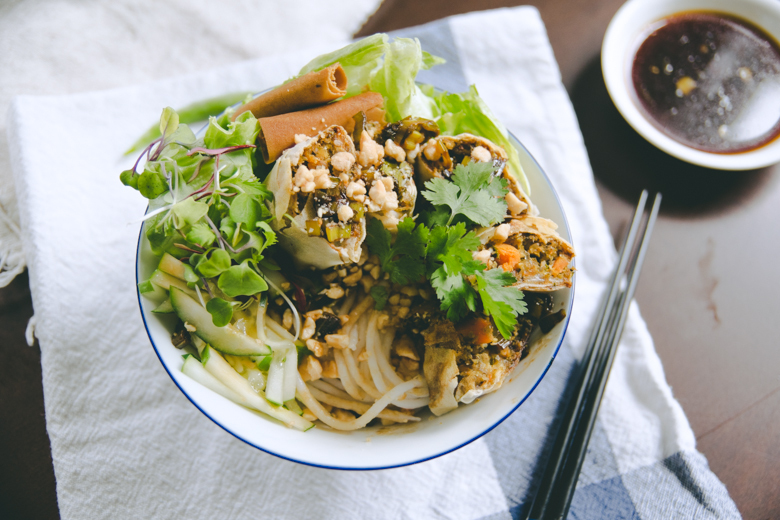 According to Josh’s testament, I have a knack for noodles, so I hope those of you who love noodles & spring rolls try out this recipe. Besides, just because the egg roll’s seasonal moniker states it’s perfect for spring doesn’t mean you can’t enjoy it during autumn either! The recipe looks easy, and delicious! My family really loves eating egg rolls, though they usually like the ones with pork in them. My brother is a complete carnivore. If he didn’t have meat i think he would probably just fall over in shock. Haha. Just wondering where is it that you are picking up all these asian goodies on the east coast? I’ve often wondered if they have 99 ranch or any kind of asian chain supermarket over there. Well, not every meal has to have meat in it to be delicious! Healthier to space out the consumption of meat…especially if it means incorporating more healthy food in his diet. I’m completely baffled by this question……surely you know that there are Asian restaurants in every state, thus there have to be Asian grocery stores where there are neighborhoods with Asians. The East Coast, especially New York, is famous for their Chinatown, which is even mentioned in the ridiculously popular song, “Ho Hey” by The Lumineers. Since Michelin stars were awarded in 2005 in New York, they’ve had about 126 restaurants since then with 1 to 3 stars awarded, many of which are Asian restaurants. So, obviously, there are plenty of places in New England & on the East Coast to get Asian groceries. Just a few weeks ago you saw in my post that I made Josh’s family a Vietnamese dish. His family lives in Florida & I definitely didn’t preorder the food from California. H Mart is a chain supermarket in the area, but is a bit of a hike from where I live. 99 Ranch Market is exclusive to California, Washington, Texas, & Nevada, so no, there isn’t a 99 Ranch in Boston, but large Asian supermarkets do not need to be present in order for me to get Asian goodies because there are small Asian grocers that do just fine. Also, I live about 1.5 miles away from Boston’s Chinatown. Fresh light dishes are never wrong, regardless of season! It looks really nice although I wouldn’t be able to eat it (I’m coeliac). Hi Susanne, really sorry to hear that. I’m sure there are alternatives to my dish that would make GF. 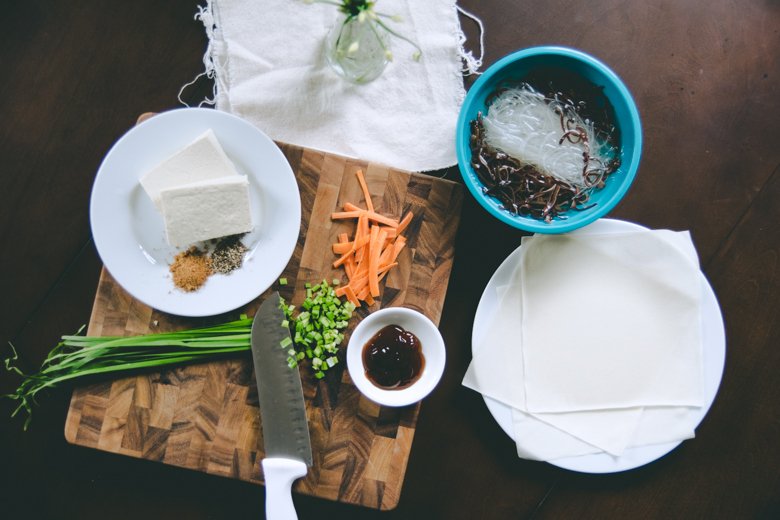 Let it be spring rolls all year long! Seriously, I need these more often in my life. I never had them in combination with noodles. Your bowl is so cute: great food photography, my dear. Thank you, Daniela! You should give it a go one day if you’re ever in Chinatown in London. 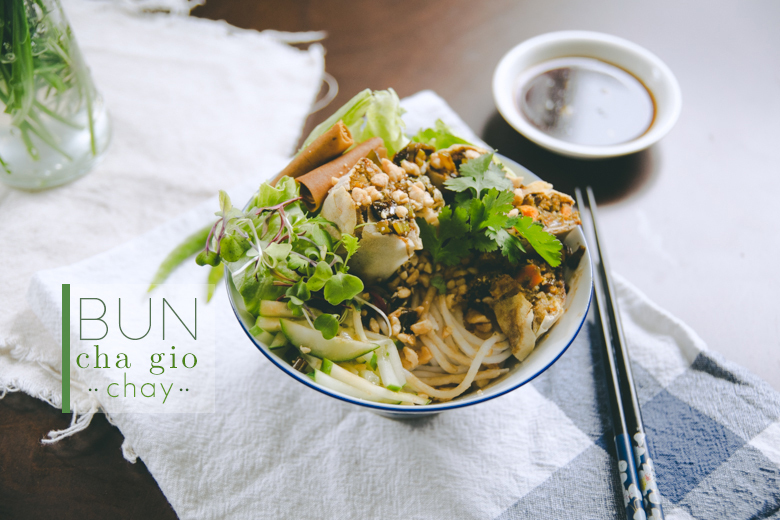 Stop by a Vietnamese restaurant & order their Bun Cha Gio! But only if it says “chay” at the end. No “chay” means not vegetarian! Hah! I started cooking when I was about 7 or 8, but I didn’t really get better until I started college. It’s really only been about 6 years since I’ve actively worked on my cooking skills, so you can pick it relatively quickly if you have the right tools & tutor. Watching videos from Sorted Food really helps because they’re so dreamy haha. Also, I’d recommend any of the books by the editors of Whole Living Magazine. Each recipe has its own picture, easy to follow instructions, & the ingredients are so simple, yet the product turns out delicious EVERY SINGLE TIME. It takes a lot of practice. I still make bad dishes every once in a while, so you just have to work at it. for a moment there i was confused between spring rolls and salad rolls, or in your case, summer rolls because i usually call summer rolls “vietnamese rolls” HA-HAHA. 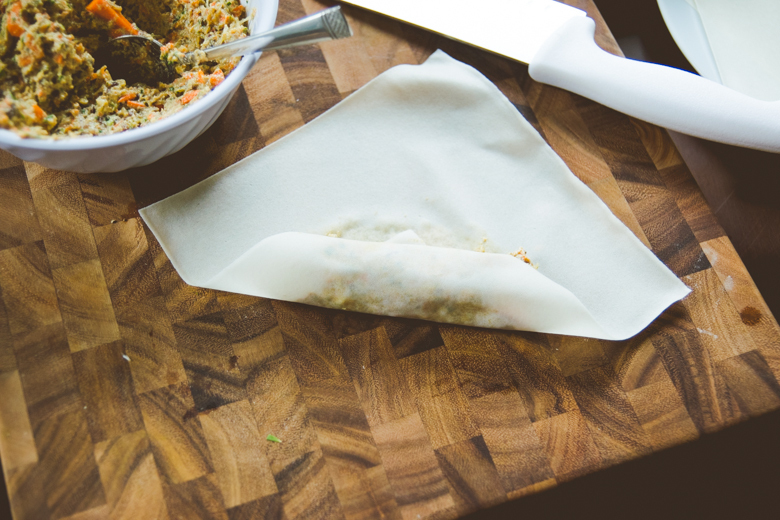 then it hit me that summer rolls are those that use rice-like wrappers – banh trang, isn’t it? 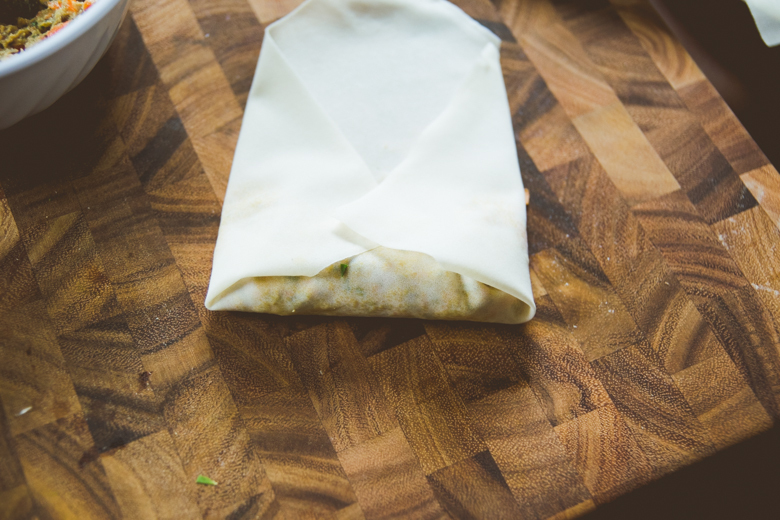 while spring rolls use wraps that are thicker and not transparent. the wrapper you used here reminds me of the ones used to make chinese dumplings- are they the same thing? Summer rolls are indeed Vietnamese! They’re also called salad rolls & other things like fresh rolls or something. The point is that they’re the ones that aren’t fried or baked, but fresh. Banh trang is correct. 🙂 Spring roll wrappers are usually made with eggs & flour, which is why they appear to be more brown. However, if you go down your Asian grocery store aisle, you’ll see that banh trang wrappers will also say, “spring roll wrappers” on them even though they’re more popularly used for summer rolls. This is because you can also use banh trang to make spring rolls! Just toss it in a saucepan with boiling oil & there you have it. The wrappers I used are indeed Chinese. As you know, Vietnam borders China so our cuisine is heavily influenced by the Chinese (& then later the French when they colonized Vietnam for a long time). However, they’re not the same as the ones you’d use for dumplings. 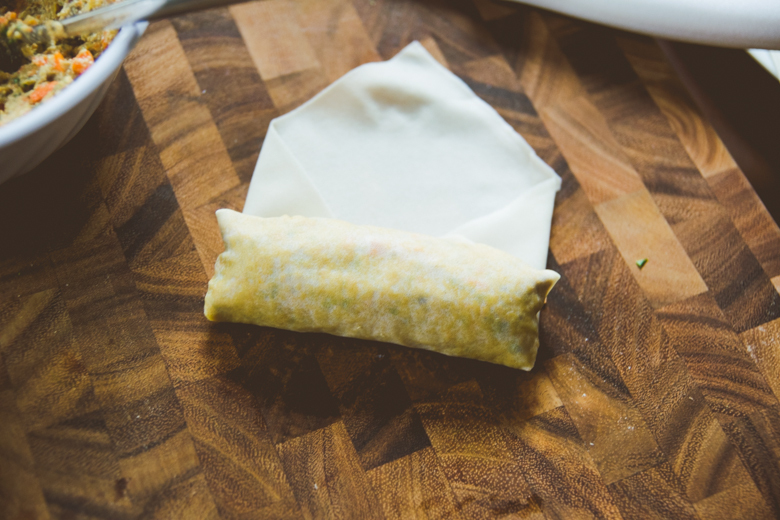 Wonton wrappers have a much thicker & smoother consistency than egg roll wrappers. Their ingredients are similar, but different enough that their tastes differ. 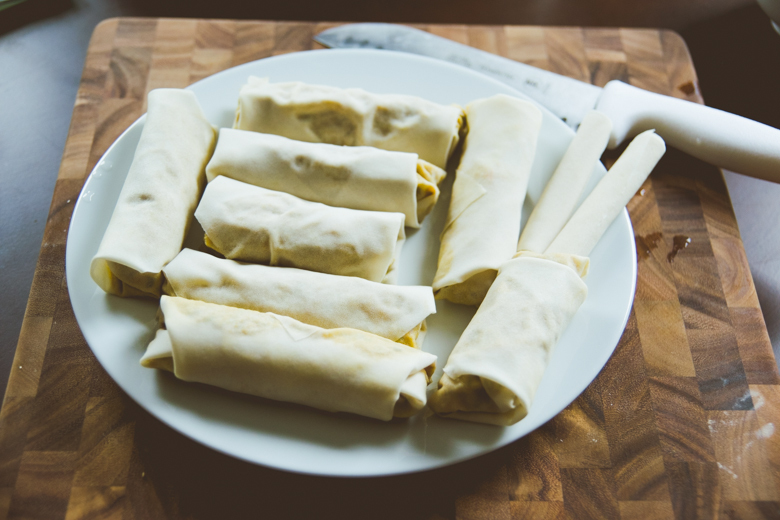 Egg rolls aren’t really that easy to make if you’re not good at rolling them hah, so I’d recommend making summer rolls for practice. It really requires boiling water for the noodles & then choosing a protein to put inside. I think you should actually try making them, I do have a recipe for vegetarian ones & pescetarian ones. 🙂 You don’t really need to be here to experience my cooking, you can do it at home yourself! Just try. Everyone should learn how to cook – it’s a basic life skill! I love fish balls haha! Love them in my noodle soups & what not. 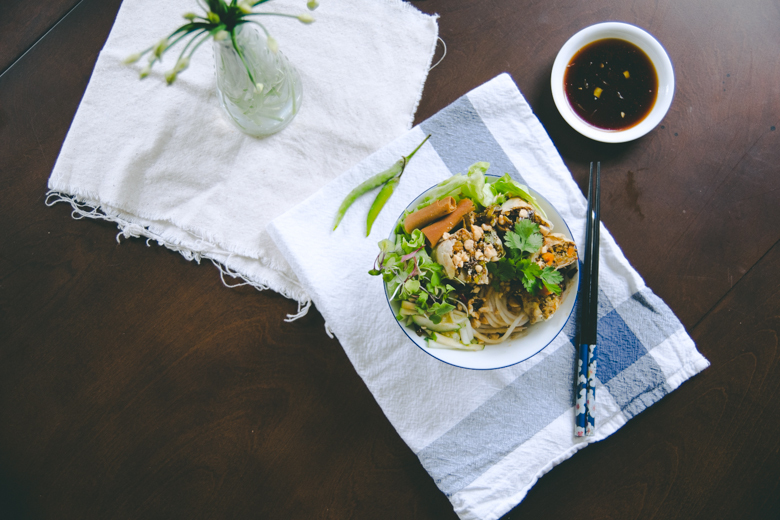 Fish sauce is really great on a lot of things, so is Sriracha! The real one from California, none of that fake crap. 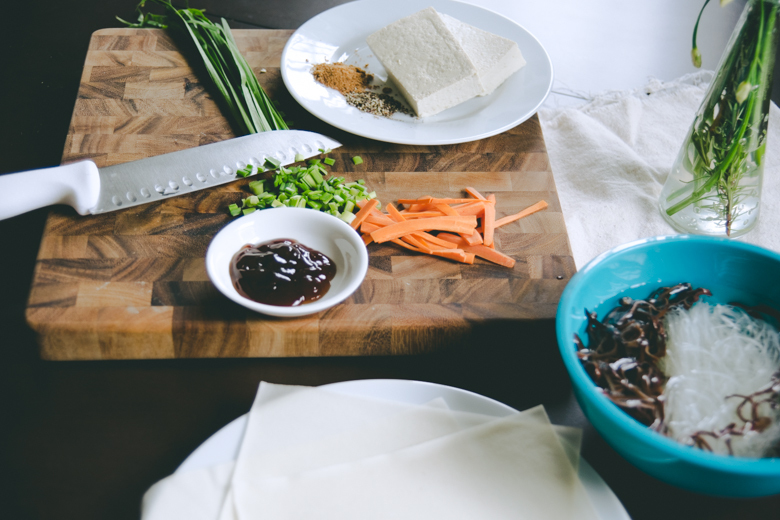 Making a vegan fish sauce is pretty tough. I haven’t made a batch that I can post online yet because the recipe isn’t good enough yet. Sigh…I’ll have to try again. Thank you! I love summer rolls too, but these weren’t summer rolls, they’re spring rolls, which aren’t fresh. They’re baked. I love egg rolls! When I order a bun dish, I usually get one with egg rolls on it. They’re so tasty 🙂 I like that your recipe bakes the spring/egg rolls. When my mom makes them, she uses a deep fryer, which I find is a pain to do. Even though we have a deep fryer, we rarely use it because it feels so troublesome (and well, not very healthy either). I love egg rolls! Especially dipped in vinegar, OH YES. But then again, I can eat almost anything with vinegar. I’m always shocked when I hear someone say they hate it. How can you not? It’s so delicious and the bite hurts good. I prefer fish sauce over vinegar. I don’t think I’ve ever seen anyone eat them with vinegar. Thanks, I appreciate it so much, but I’ve already been nominated before so I technically can’t accept it again! Egg rolls are so delicious! It’s amazing how fish sauce can be found in so much Viet food. I know some non-Asians who mistook the sauce as some kind of soup and drank from it before.. I’ve been meaning to make cha gio for a while but never had the time or the right idea to start things up. Looking at the blender, I suppose I have my first step in. Hope you enjoyed the noodles and egg rolls :D! My mom stores her fish sauce at her office in POM bottles, so when I was working at her office, I went into the break room to get a swig of what I thought was POM. Nope. NOPE. Not POM, fish sauce. So sad. Well, I posted up my recipe so you’re not lost on how to go about making cha gio. It’s not a blender that you’re looking at though, it’s a food processor. It’s only $40 on Target so if you’re interested in making Asian food, invest in it. 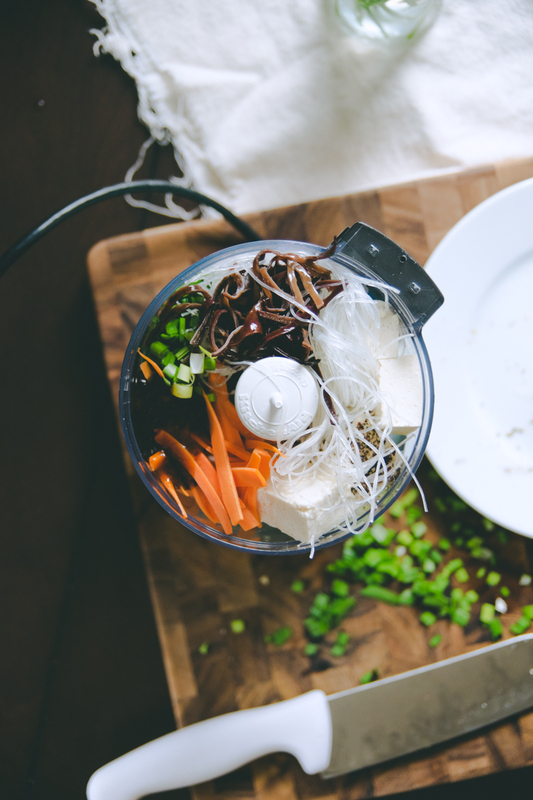 The best Asian food is ground up & stuffed into something! Okay, this is going to be really embarrassing, but… I’ve never had the pleasure of tasting Vietnamese food! I don’t think we have that many Vietnamese restaurants here, and I am not such a great cook myself, so I usually stick to basic dishes that I know. Yours look absolutely delicious, though, and I LOVE egg rolls! (but have only tried the one from our local Chinese place). Maybe I’ll take a chance and venture into making them myself, Vietnamese-style. I already have fish sauce! (which I use for making meatballs with pork chop meat, believe it or not. It’s divine!). Hi Sofie! Vietnamese food is pretty underrated, so if you ever get the chance to find a highly rated Vietnamese restaurant in your area, go for it. Fish sauce was also used by the Romans too, so if your spaghetti ever lacks any flavor, just add a tablespoon of it in your sauce & you’ll be surprised at how delicious the flavors turn out! I remember one of the first times I went to a Vietnamese restaurant (which was a good decade ago, at least), I was so surprised to see that they had autumn, summer and winter rolls, as well as the well known spring roll. I was so intrigued that I just ordered a plate with one of each. Since then, I haven’t had the other seasons’ rolls, but I think I’ll look into them because I find it really fascinating. Wow Georgina, way to leave a comment on my blog about your life story bahahaha. I always order spring rolls when I’m having a take-away, but I’ve never made them myself. You make them look so simple to make! I’ve also never tried Vietnamese cuisine before. I’m sure their must be a restaurant specialising in it somewhere in this city. 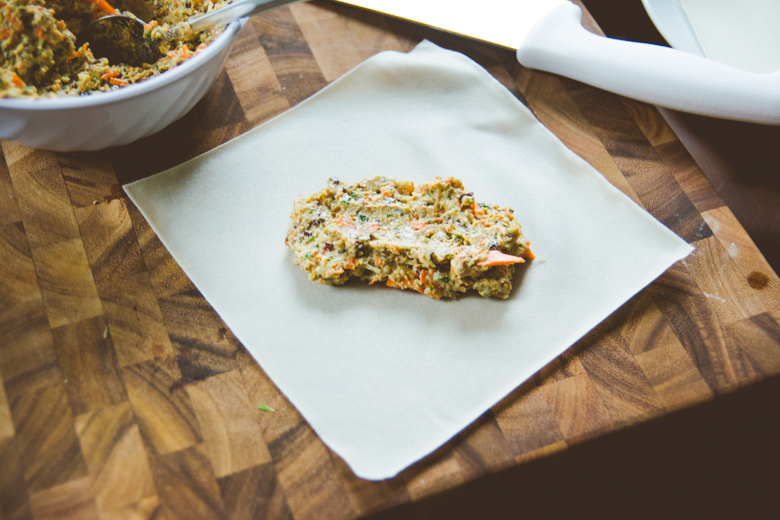 If you have a food processor, they’re pretty easy to make. I’m sure if you venture into Chinatown in London, you’ll stumble upon a good Vietnamese restaurant. I’ve been to a Chinese/Vietnamese restaurant there & it wasn’t so bad!